When I was pregnant there were a few items that I knew I needed to get before the baby was born and one of those items was a bassinet. We had a bassinet for our daughter and it was great being able to put her in her own space so that our bed was free just for us but it was also nice to be able to have her close by for her night time feedings. Unfortunately we left her bassinet in Connecticut before our move to Georgia so we did not have one for the new baby, so I went searching for a new one online. The bassinet I found that I thought would fit into our family’s needs the most was the HALO Bassinest Swivel Sleeper. The first thing that stood out to me about the Bassinest was that it is ideal for mother’s who are recovering from a C-section. I ended up with a C-section with my daughter and I had a good idea that I would also end up with one with my son so I knew that a bassinet like this would help a lot during my recovery. The way it helps is that one of the sides of the Bassinest can easily be pushed down so that it is easier to lift the baby out of it instead of having to reach down into the bassinet and lift up. It can be so painful during those weeks of recovery after a C-section and it is really great that HALO kept those moms in mind when making the Bassinest. Another reason why I wanted to get the HALO Bassinest was because the height can be adjusted. This was important because when the bassinet your baby is sleeping in is the same height as your bed it is a lot easier to lift the baby out especially when you pair that with the push down side. This is also great because you can adjust the Bassinest so it is slightly higher than your bed and it becomes a co-sleeper but one that can easily be moved out of the way if you end up needing more space on the bed for yourself or your significant other. 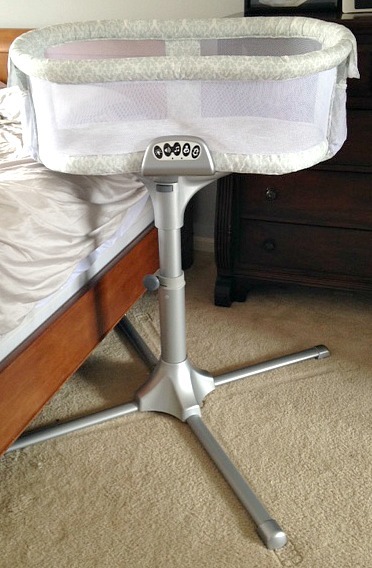 The HALO Bassinest is easily moved because it swivels and it also turns 360 degrees around. This didn’t just come in handy for me during the night but during the day even when my son wasn’t in it I liked how easy it was to move out of the way for when I needed to get by the Bassinest, I could nudge it slightly and I had enough room to go past. 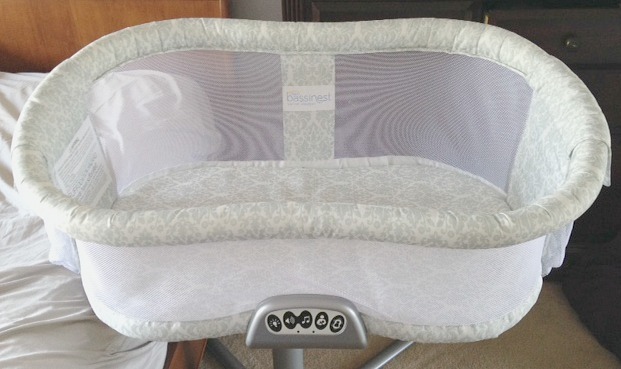 The Halo Bassinest includes an attached soothing center. It includes a nightlight that shines into the Bassinest so that the baby can easily be seen during those wee hours of the night when they get up to be fed. It has 6 sounds that can be played which includes 3 lullabies, nature sounds and a womb sound to help comfort the baby when they are alone at night. The fourth button from the left is for a nursing timer, this is very handy, especially in the early days, for anyone who might easily sleep through the 2-3 hour mark of needing to get up to feed the baby. The alarm will go off when it is time to feed the baby again. The last button has two settings for vibration to help comfort the baby while they are sleeping. 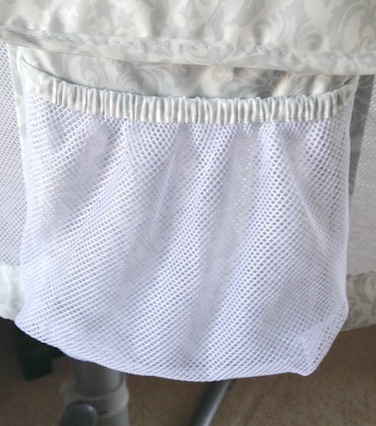 The HALO Bassinest also has two pockets, one on either side. These made it easy to store any feeding or sleeping needs that you may need in the middle of the night so you don’t have to try and find them while it is pitch black. Some things that could be kept in the pockets are a phone, a book, a couple of the pre made formula bottles, a burp cloth, etc. There really is nothing bad that I would find about the HALO Bassinest. There was one thing I thought might be an issue, that it is very heavy and hard to move the whole thing around, but because it is heavy it is very sturdy and almost impossible to knock down which is a great feature! 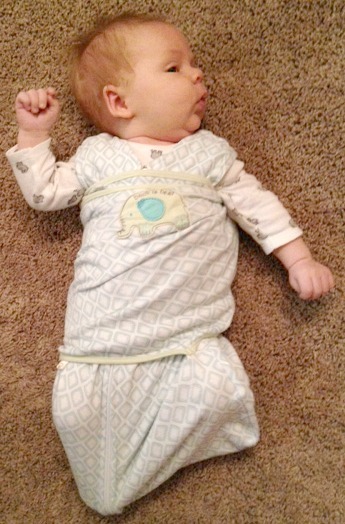 Another great product that is made by HALO is the HALO SleepSack Swaddle. With my daughter I was a pro at wrapping her in blankets, she would “escape” every once in a while but I had gotten really good at being able to keep her tight in the blanket so she could sleep soundly without hitting or scratching herself in the face. With my son I am horrible at wrapping him in blankets. I don’t know why but every time I try to wrap him in one half his chest is not covered and his arms are free within seconds so I am very thankful for the invention of the swaddle. 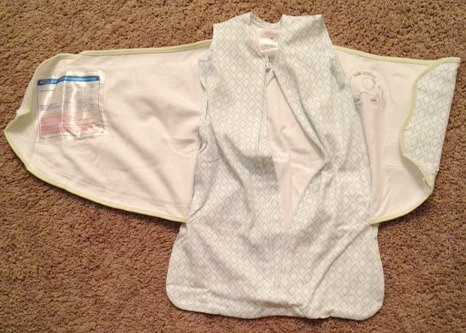 The SleepSack Swaddle is a sleep sack and a swaddle all in one. This is great because my baby can have his legs free in the sack but his arms and hands are kept tight against him so he doesn’t wake himself up by hitting or scratching his face. 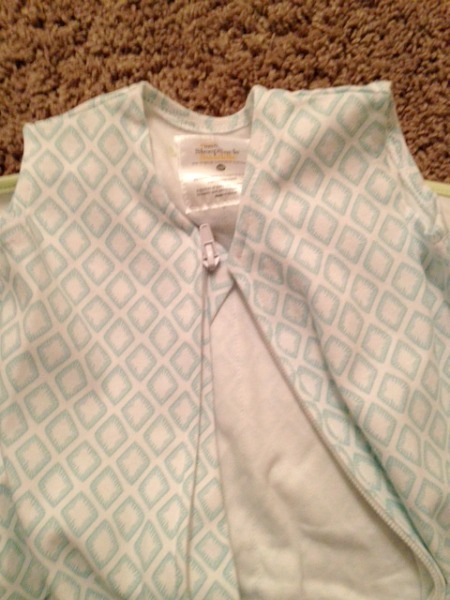 The zipper for the SleepSack Swaddle starts at the top by the baby’s chest and zips down. 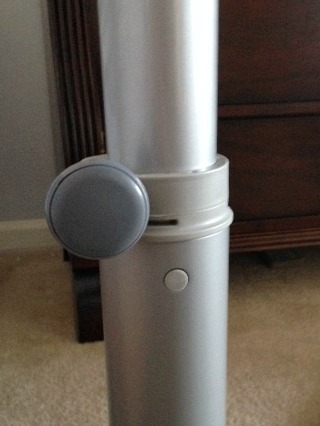 This makes it easier to change the baby because you don’t even have to unswaddle the baby during the change. It also makes it more comfortable for the baby because they don’t have a zipper right under their chin. 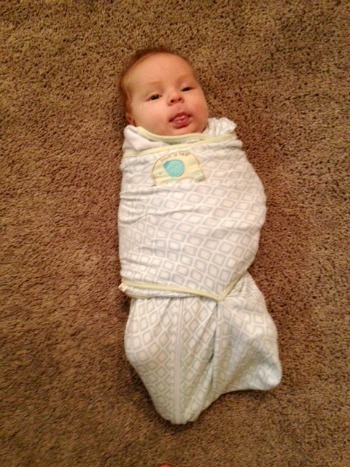 Above is a picture of my son in the HALO SleepSack Swaddle. It is so easy to use. All that I need to do to get him swaddled is to zip him in the sack and then pull each side of the swaddle over his arms making sure to place the Velcro in the correct places. It is a lot easier than using a blanket, I get it right 100% of the time now instead of 20% of the time! My favorite part about the SleepSack Swaddle is that when I don’t want or need my son to be swaddled I can let his arms be free but I don’t have to take him out of it. That way I can easily swaddle him again when his next nap comes up. To free his arms is really easy. All that I have to do is open the swaddle and then close it around his abdomen and all velcros are out of the way and he can easily move his arms about. Below is a video of both the HALO Bassinest and the HALO SleepSack Swaddle in action. Both are great products and products I don’t know if I could have survived the last few months without!